Made available in DSpace on 2015-07-24T13:10:27Z (GMT). 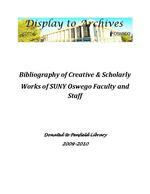 Creative & Scholarly Works of SUNY Oswego Faculty & Staff Page 2 of 12 Penfield Library, SUNY Oswego 2009 2010 Abr aham, Stev en [Marketing & Management] ...A drienne Eaton and Paula Resulting Labor Rel ations and Advances in Industrial and Labor Relations 17 (2010): 1 30. Print. First Contract Effects." Annual Meeting of the Labor and Employment Relations Association. San Francisco, CA. January 2009. Paper presented. Journal of Education for Business 84.6 (2009): 350 356. Print. Andrews, David [Economics] The Background to Hawtrey's Ethics." History of Political Economy 42.2 (2010): 297 322. Print. Keynes and the British Humanist Tradition: The Moral Purpose of the Market New York: Routledge, 2010. Print. Auler, Robert [Music] American Century Recorded and mixed by Dan Wood. Rec. Summer 2009. Oswego Music, 2009. CD. Altschuler, Bruce [Political Science] Columbia Journalism Review (June 2010): n. pag. Web. 14 Sept. 2010. < http://www.cjr.org/campaign_desk/ south_carolina_media_mia_on_al.php > Bendinskas, Kestutis [Chemistry] Journal of Proteome Research 9 .9 (2010): 4443 4453. Print. Journal of Chemical Education 87.7 (2010): 739 741. Print. Creative & Scholarly Works of SUNY Oswego Faculty & Staff Page 3 of 12 Penfield Library, SUNY Oswego 2009 2010 are Positively Associated with Circulating Lipid Levels and Applied Physiology Nutrition and Metabolism 35 .4 (2010): 518 525. Print. Beyerbach, Barbara [Curriculum & Instruction] Teachers, Preservice Teachers, and K How Do We Know They Know? Ed. R. Debor ah Davis, Arcenia London, Barbara Beyerbach. New York: Peter Lang, 2009. 199 210. Print. Impact of Two Courses in a Social Justice Oriented Program How Do We Know They Know? Ed. R. Deborah Davis, Arcenia London, Barbara Beyerbach. New York: Peter Lang, 2009. 27 44. Print. Birdsall, Robert [Chemistry] Journal of Proteome Research 9 .9 (2010): 4443 4453. Print. Bruch, Martha [Chemistry] Journal of Chemical Education 87.7 (2010): 739 741. Print. Burrell, Marcia [Curriculum & Instruction] Teachers, Preservice Teachers, and K How Do We Know They Know? Ed. R. Deborah Davis, Arcenia Lo ndon, Barbara Beyerbach. New York: Peter Lang, 2009. 199 210. Print. Card, Robert [Philosophy] Utilitas 22.4 (2010): 481 493. Print. Carlson, Lynn [Mathematics] Hallagan, and Audrey R Refining Models of Algebraic Generalization Among Excelsior: Leadership in Teaching and Learning 4.1 (2009): 20 31. Print. Creative & Scholarly Works of SUNY Oswego Faculty & Staff Page 4 of 12 Penfield Library, SUNY Oswego 2009 2010 Chaudhari, Ram [Physics, Emeritus] Vigyan Prakash 6.3 4 (2008) Print. pg? Vigyan Praka sh 6.1 2 (2008): 2. Print. Editorial. "Hindi The Official Language of India." Vigyan Praka sh 6.3 4 (2008): 2. Print. Vigyan Praka sh 6. 1 2 (2008): 11 19. Print. Davis, R. Deborah [Curriculum & Instruction] How Do We Know They Know? Ed. R. Deborah Davis, Arcenia London, Barbara Beyerbach. New York: Peter Lang, 2009. Print. "Minorities vs. Minority Groups: How Language Defines, Defiles and Denigrates for Life." Diversity and Multiculturalism: A Reader Ed. Shirley Steinberg. New York: Peter Lang, 2009. 123 129. Print. Delaney, Tim [Sociology] The Inter national Journal of the Humanit ies 8.1 (2010): 23 31. Print. Academe Online American Association of U niversity Professors, Sept. Oct. 2010. Web. 14 Oct. 2010. . Dighe, Ranjit [Economics] North American Journal of Eco n o m ics and Finance 21 .2 (2010): 165 181. Print. Dumas, Amy [Psychology] Levels are Positively Associated with Circulating Lipid Levels and Applied Physiology Nutrition and Metabolism 35 .4 (2010): 518 525. Print. Fairbrother, Anne [Curriculum & Instruction] How Do We Know They Know? Ed. R. Deborah Davis, Arcenia London, Barbara Beyerbach New York: Peter Lang, 2009. 9 26. Print. Creative & Scholarly Works of SUNY Oswego Faculty & Staff Page 5 of 12 Penfield Library, SUNY Oswego 2009 2010 Fenlon, Amanda [Curriculum & Instruction] Jessica McNabb, and Meaningful Literacy Routines for Student Teachin g Exceptional Children 43.1 (2010): 42 48. Print. What Really Matters for Students With Disability Labels: Preparing for How Do We Know They Know? Ed. R. Deborah Davis, Arcenia London, Barbara Beyerbach New York: Peter Lang, 2009. 135 164 Print. Friedman, Barry [Marketing & Management] The BRC Journal of Advance in Business (2009): 14 28. Print. Gump, Brooks [Psychology] Journal of Proteome Research 9 .9 (2010): 4443 4453. Print. the Metabolic Syndrome in Childre Applied Physiology Nutrition and Metabolism 35.4 (2010): 518 525. Print. Hallagan, Jean [Curriculum & Instruction] Lynn Carlson, and Audrey Refining Models of Algebraic Generalization Among El Excelsior: Leadership in Teaching and Learning 4.1 (2009): 20 31. Print. Harrell, Mary [Curriculum & Instruction] How Do We Know They Know? Ed. R. Deborah Davis, Arcenia London, Barbara Beyerbach. New York: Peter Lang, 2009. 187 198. Print. Ilie, Carolina [Physics] eractions with O rganic Ferroelectr ic Polymers. Journal of Electron Spectroscopy and Related Phenomena 174 .1 3 (2009): 10 21. Print. Kane, John [Economics] Minor Eastern Economic Journal 36 (2010): 370 390. Print. Creative & Scholarly Works of SUNY Oswego Faculty & Staff Page 6 of 12 Penfield Library, SUNY Oswego 2009 2010 Kane, Sharon [Curriculum & Instruction] Shoving Too Much Information Down Your Throat Kind of How Do We Know They Know? Ed. R. Deborah Davis Arcenia London, Barbara Beyerbach. New York: Peter Lang, 2009. 165 186. Print. Karns, Lanny [Marketing & Management] Journal of Education for Business 84.6 (2009): 350 356. Print. Kulikowski, Mark [History] 200 Polish American Studies 66.1 (2009): 55 85. Print. Lang l ois, Lisa [ Art] "Japan Modern, Ancient, and Gendered at the 1893 Chicago World's Fair." Gendering the Fair: Histories of Women and Gender at World's Fairs Ed. TJ Boisseau and Abigail Markwyn. Urbana, IL: University of Illi nois Press, 2010. 56 74. Print. Loe, Mary [Library, Emerita] "Raised in a House Built of Books: Reading as a Way of Life." Toward the Final Crossroads: A Festschrift for Edna and Howard Hong Ed. Jamie Lorentzen. Macon, GA: M ercer University Press, 20 09. 35 49. Print. London, Arcenia [Curriculum & Instruction] How Do We Know They Know? Ed. R. Deborah Davis, Arcenia London, Barbara Beyerbach. New York: Peter Lang, 2009. Print. MacEntee, Virginia [Curriculum & Instruction] How Do We Know They Know? Ed. R. Deborah Davis, Arcenia London, Barbara Beyerbach. New York: Peter Lang, 2009. 87 106. Print. MacKenzie, James [Biology] Journal of Proteome Research 9 .9 (2010): 4443 4453. Print. European Journal of Neuroscience 32 .4 (2010): 560 569. Print. Creative & Scholarly Works of SUNY Oswego Faculty & Staff Page 7 of 12 Penfield Library, SUNY Oswego 2009 2010 Applied Physiology Nutrition and Metabolism 35.4 (2010): 518 525. Print. Markert, Linda Rae [Education, Dean] Contemporary Technology: I nnovations, Issues, and Perspectives. 5 th ed. Tinley Park, IL: The Goodheart Willcox Company, Inc. 2010. Print. Nichols, James T. [Library] College & Research Libraries 70.6 (2009): 515 530. Print. Offen, Julia [Anthropology] Ethnography 11.3 (2010): 473 484. Print. Opello, Walter [Political Science] Wheeler. Historical Dictionary of Portugal Lanham, MD. : The Scarecrow Press, Inc., 2010. Print. Parry, Michelle [Library] Perspectives on Dynamic Collections and Effective Journal of Interlibrary Loan, Document Delivery & Electronic Reserve 20 .2 (2010): 115 215. Print. Parsons, D ennis [Curriculum & Instruction] nerating Expectations for Student Achievement) on Teachers, Preservice Teachers, and K How Do We Know They Know? Ed. R. Deborah Davis, Arcenia London, Barbara Beyerbach. New York: Peter Lang, 2009. 199 210. Print. Narrati ves in Transformation: Negotiating P re Service T Urban Life and T How Do We Know They Know? Ed. R. Deborah Davis, Arcenia London, Barbara Beyerbach. New York: Peter Lang, 2009. 107 134. Print. Peng, Bruce Lo ng [Curriculum & Instruction] How Do We Know They Know? Ed. R. Deborah Davis, Arcenia London, Barbara Beyerbach. New York: Peter Lang, 2009. 45 86. Print. Creative & Scholarly Works of SUNY Oswego Faculty & Staff Page 8 of 12 Penfield Library, SUNY Oswego 2009 2010 Pritting, Shannon [Library] T each Information Literacy to Adult Teaching Non traditional Learners: Tools for Creative Instruction Ed. Helene E. Gold. Pittsburgh, PA: Library I nstru ction Publications, 2010. 19 24 Print. The Library Instruction Cookbook. Ed. Ryan L. Sittler and Douglas Cook. Chicago, IL: American Library Association, 2009. 54 55. Print. Ramalho, Tania [Curriculum & Instruction] Teachers, Preservice Teachers, and K How Do We Know They Know? Ed. R. Deborah Davis, Arcenia London, Barbara Beyerbach. New York: Peter Lang, 2009. 199 210. Print. Education: Impact of Two Courses in a Social Justice Oriented Program How Do We Know They Know? Ed. R. Deborah Davis, Arcenia London, Barbara Beyerbach. New York: Peter Lang, 2009. 27 44. Print. Roosa, Kristen [Biology] the Metabolic Syndrome i Applied Physiology Nutrition and Metabolism 35.4 (2010): 518 525. Print. Rosenbaum, Peter [Biology] and Andrew Nelson. "Bog Turtle Habitat on the Lake Ontario Coastal Plain of New York State." Northeastern Naturalist 17.3 (2010): 415 436. Print. Volpe's Understanding Evolution 7 th ed. New York: McGraw Hill, 2011. Print. Rosow, Stephen [Political Science] Rethinking Realism in International R elations: Between Tradition and Innovation. Ed. Annette Freyberg Inan, Ewan Harrison, Patrick James Baltimore, MA: The Johns Hopkins University Press, 2009. 233 252. Print. and Thomas Kriger, eds. Transforming Higher Education: Economy, Democracy, and the University. Lanham, MD: Lexington Books, 2010. Print. Creative & Scholarly Works of SUNY Oswego Faculty & Staff Page 9 of 12 Penfield Library, SUNY Oswego 2009 2010 Russo, Patricia [Curriculum & Instruction] ce Pre K How Do We Know They Know? Ed. R. Deborah Davis, Arcenia London, Barbara Beyerbach. New York: Peter Lang, 2009. 9 26. Print. Schell, Robert [Curriculum & Instruction, Emeritus] ... Samantha Baldwin, and Trick or Treat Candy Getters and Hornet Scare Devices: The Journal of Creative Behavior 43.3 (2009): 149 168. Print. Schmitt, Elizabeth Dunne [Eco nomic s] North American Journal of Economics and Finance 21 .2 (2010): 165 181. Print. Schnorr, Roberta [Curriculum & Instruction] What Really Matters for Students With Disability Labels: Preparing for How Do We Know They Know? Ed. R. Deborah Davis, Arcenia London, Barbara Beyerbach. New York: Peter Lang, 2009. 135 164 Print. Schofield, Damian [ Huma n Computer Interaction ] Andrew Dasys and Pavel Vasa SME Annual Meeting. Phoenix, AZ. 3 Mar. 2010. Print. Computer Aided Forensic Facial Co mparison Ed. Martin Evison and Richard Vorder Bruegge. Boca Raton, FL: CRC Press, 2 010. 89 101. Print. Ma rti n Evison and Lorna Goodwin. hree 3D S Computer Aided Forensic Facial Comparison Ed. Martin Evison and Richard Vorder Bruegge. Boca Raton, FL: CRC Press, 2 010. 11 33 Print. and Computer Aided Forensic Facial Co mparison Ed. Martin Evison and Richard Vorder Bruegge. Boca Raton, FL: CRC Press, 2010. 103 119. Print. Journal of Forensic Sciences 55.1 (20 10): 159 162. Print. Creative & Scholarly Works of SUNY Oswego Faculty & Staff Page 10 of 12 Penfield Library, SUNY Oswego 2009 2010 Learning in a Virtual Environment: Should There B e Guidelines?" Proceedings of the World Conference on Educational Multimedia, Hypermedia and Telecommunications (Ed Media) 28 June 2 July 2010. Chesapeake, VA: AACE. n pag. Web onments: The Problems of Organiz Proceedings of the SME Annual Meeting 3 Mar. 2010. Littlet on, CO: SME. 510 519. Print Peter Chapman, eer Assessment and Dominance During Group Work Seminar.net 6.1 (2010): 94 110. Print. nse Training in the Journal of Emergency Management 8.2 (2010): 45 56. Print. Learning in Engineering Seminar.net 6.1 (2010): 76 93. Print. Shockey, Karen [Library] The Library Instruction Cookbook Ed. Ryan L. Sittler and Douglas Cook. Chicago, IL: American Library Association, 2009. 54 55. Print. Sime, Karen [Biology] Crop Domestication Relaxes Both Top down and Bottom up Effects on a Specialist Basic and Applied Ecology 10.3 (2009): 216 227. Print. Fopius a risanus as a Biological Control Agent for the Olive Fruit Fly in Ag ricultural and Forest Entomology 10 .4 (2008): 423 431. Print. Psyttalia lousburyi (Hymenoptera: Braconidae), Potential Biological Control Agent for the O Biological Control 44 .1 (2008): 79 89. Print. Spizman, Lawrence [Economics] Eastern Economic Journal 36 (2010): 370 390. Print. "Forensic Economics." 21st Century Economics: A Reference Handbook Ed. Rhona Fr ee. 2010. Los Ange les: Sage, 2010. 739 746. Print. Sternlicht, Sanford [Theatre Emeritus] Modern Irish Drama: W.B. Yeats to Marina Carr Syracuse, N.Y. : Syracuse University Press, 2010. Print. Creative & Scholarly Works of SUNY Oswego Faculty & Staff Page 11 of 12 Penfield Library, SUNY Oswego 2009 2010 Stuck, Mary Frances [Sociology] echnical Education On Line Classrooms: International Journal of Adult Vocational Education and Technology 1.3 (2010): 46 59. Print. er Issues in O n Proceedings of World Conference on E Learning in Corporate, Government, Healthcare, and Higher Education 2010 Chesapeake, VA: AACE 2010 2403 2409. Print. Sturr, Natalie [Library] ves on Dynamic Collections and Effective Journal of Interlibrary Loan, Document Delivery & Electronic Reserve 20 .2 (2010): 115 215. Print. Tribunella, Thomas [Accounting, Finance and Law] . The BRC Journal of Advances in Business (2009): 14 28. Print. Turco, Lewis [English Emeritus] "The Ferry." Portland: Summerguide Summer 2010: 231 237. Print. Per Contra 19 (2010): n. pag. Web. 15 Oct.2010. < http://www.percontra.net/19turco.htm >. Interview by Mike Chasar. Poetry & Popular Culture N.p., 3 Apr. 2010. Web. 15 Oct.2010. . Connotation Press : An Online Ar tifact 3.2 (2010) n.pag. Web. 10 Oct. 2010. "John." The Nervous Breakdown The Nervous Breakdown. 19 June 2010: n. d. Web. 15 Oct. 2010. . "Lewis Turco: The TNB Self Interview." The Nervous Br eakdown The Nervous Breakdown n.d. Web. 19 June 2010. . "Pookah, The Greatest Cat in the History of the World." The Tower Journal 2.4 ( 2010 ) : n. pag. Web. 15 Oct. 2010. . "Recognitio n." Nights and Weekends.Com 5 Apr. 2010: n. pag. Web. 15 Oct. 2010. .
Creative & Scholarly Works of SUNY Oswego Faculty & Staff Page 12 of 12 Penfield Library, SUNY Oswego 2009 2010 "Second Sight." Per Contra 17 (2010): n. pag. Web. 15 Oct. 2010. . "Sleeping and Waking." Voices in Italian Americana 21.1 (2010): 167 172. Print. "Song of the Mower: The Memoir of a Navy Buddy." The Tower Journal 2.3 ( 2009 2010 ) : n. pag. Web. 15 Oct. 2010. . Connotation Press: An Online Artifact 3.3 (2010). n.pag Web. 10 Oct. 2010. Writing as Wesli Court: The Day We Bombed the Moon (and Barack Obama Won the Nobel Peace Prize), a Sestina. The Nervous Breakdown The Nervous Breakdown n.d. Web. 16 October 2010. < http://www.thenervousbreakdown.com/wcourt/2010/09 /the day we bombed the moon and barack obama won the nobel peace prize a sestina/ >. Vadillo, Alicia E. [Modern Languages & Literature] "Recorriendo el Camino Que Describe." Rev. of Del Infierno al Paraiso Con Escala by Ernesto Clavelo. Baquiana Jan. Apr 2010: n. pag. Web. 28 May 2010. . Vanouse, Donald [English] "Oedipal Rage in Twelve Angry Men ." Literature and Psychoanalysis Proc. of the T wenty sixth International Conference on Literature and Psychoa nalysis. Ed. Frederico Pereira. Lisbon: Instituto Superior de Psicologia Aplicada, 2009. 25 30. Print. Wells, Shirley [Curriculum & Instruction] How Do We Know They Know? Ed. R. Deborah Davis, Arcenia London, Barbara Beyerbach. New York: Peter Lang, 2009. 45 86. Print. Wood, Dan [Music] American Century Performed by Robert Auler. ; r ecorded and mixed by Dan Wood. Rec. Summer 2009. Oswego Music, 2 009. CD Wray, K. Brad [Philosophy] Perspectives on Science 18.3 (2010): 311 327. Print. sophy of Science: What are the K Erkenn tnis 72 .3 (2010): 423 430. Print. Erkenn tnis 72.3 (2010): 365 377. Print.